More and more people are sending electronic cards on special occasions nowadays – via dedicated sites or social media posts. The good thing about social media (particularly Facebook) is that it reminds you of anniversaries and birthdays you would otherwise often forget. And of course you can see on your feed whether someone is celebrating something special like a new job or a personal achievement. That way you can send a message or a comment with a pretty picture or verse on it, to let them know you are thinking about them. For very special people and occasions though, I have a selection of pretty cards which I pop in the mail as a surprise. I think people appreciate the personal, physical touch of an actual card. The cards are usually not for birthdays or festivals though, but rather to say thank you or get well soon, to let someone know I am thinking about them if they are having a bad day, or congratulating them on a job well done or a new position. Wherever I go, I am always on the lookout for interesting and unusual cards. 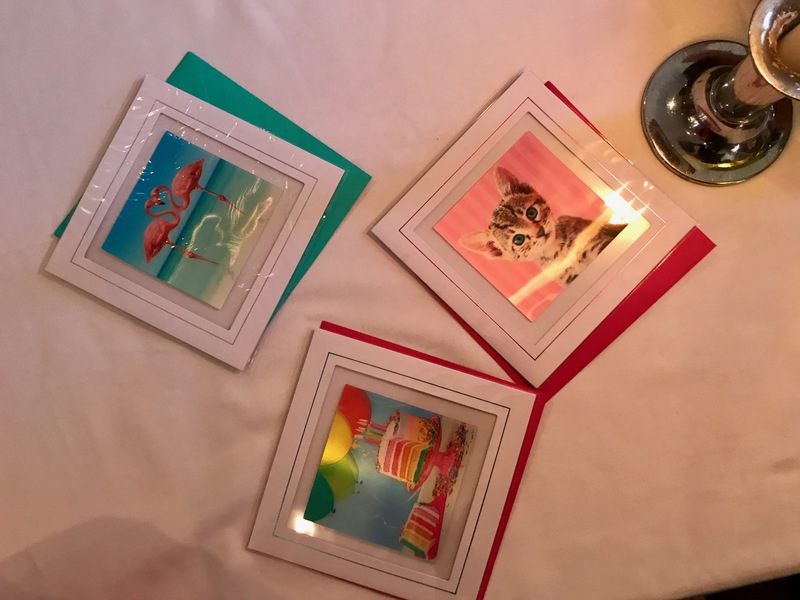 I love handmade cards with beadwork or textile effects, cards with tuxedo cats on them, pop-up cards, and cards featuring stunning photography. They are usually not expensive and don’t take up much space. I have stamps and the cards in a box at home and whenever someone needs cheering up or I want to let them know I appreciate them, I pop a little card in the mail with good thoughts. ‹ Cats – what else? So glad that I am not the only one that still likes to send physical cards. I keep a box of them, divided by event, and have a perpetual calendar with all sorts of info on it as a reminder. Every month, I take out the box and look at the calendar and write out all the cards for the next month that I know I want to send and label and stamp the envelope so that they are ready to go, by my keys, to send out when the time is right. In December, I go to the local shops, when cards are on sale, and buy a year’s worth and collect as I go along during the various holidays. The system has worked beautifully for several years now and 99% of the time keeps me from having to scramble for anything at the last minute. I am so glad I am not the only one who does this. I love receiving cards – something tangible in the regular mail seems so special these days, and even more so if it is a surprise! So nice to read! I do the same thing. I still enjoy writing a good,old fashioned letter. I too keep a stack of cards handy. I have a friend that makes beautiful cards. She’s even made me cards with a Boerboel on the front! Too few people take the time for cards these days! Oh I would love to see the BB cards – how gorgeous they must be!